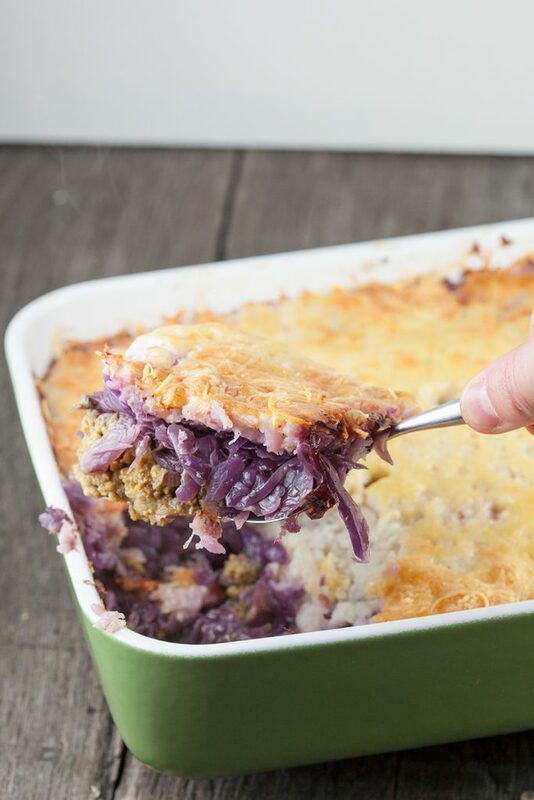 An oxheart cabbage, ground beef and celery root casserole is extra delicious when it's cold outside. Filled with veggies, spices and flavors! 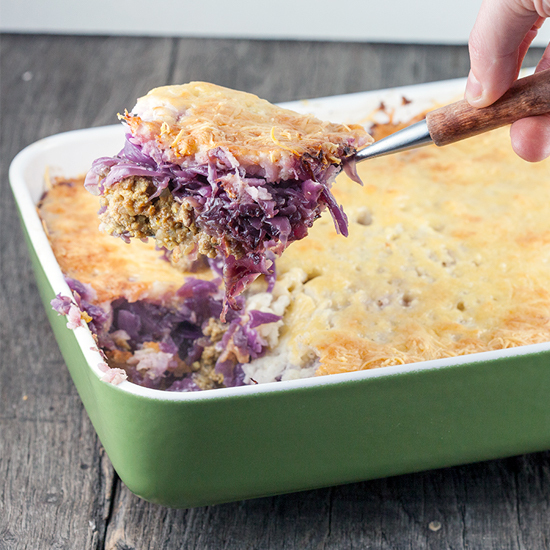 CHOP the cabbage as fine as possible, the easiest way is using a mandoline or kitchen cutting machine. The larger the pieces are, the longer they have to cook. HEAT a knob of butter in a Dutch oven and cook the cabbage for about 10 minutes. STIR occasionally and add the star anise and cloves. POUR a small layer of water into the pan, put the lid on and let it simmer for about 20 minutes. REMOVE the lid and let it cook some more until all the moisture has evaporated if needed. SEASON with pepper and salt and remove the star anise and cloves. Meanwhile PEEL and finely chop the onion and garlic cloves. PEEL the celery root, rinse it well and chop into large pieces. FILL a small pan with water and salt and bring to a boil and COOK the celery root until they’re soft enough. HEAT olive oil in a large skillet and sauté the onion and garlic cloves. ADD the ground beef and after another few minutes or cooking you can SEASON the meat with curry powder, mustard, pepper and salt. PRE-HEAT the oven to 180 degrees Celsius or 350 degrees Fahrenheit. 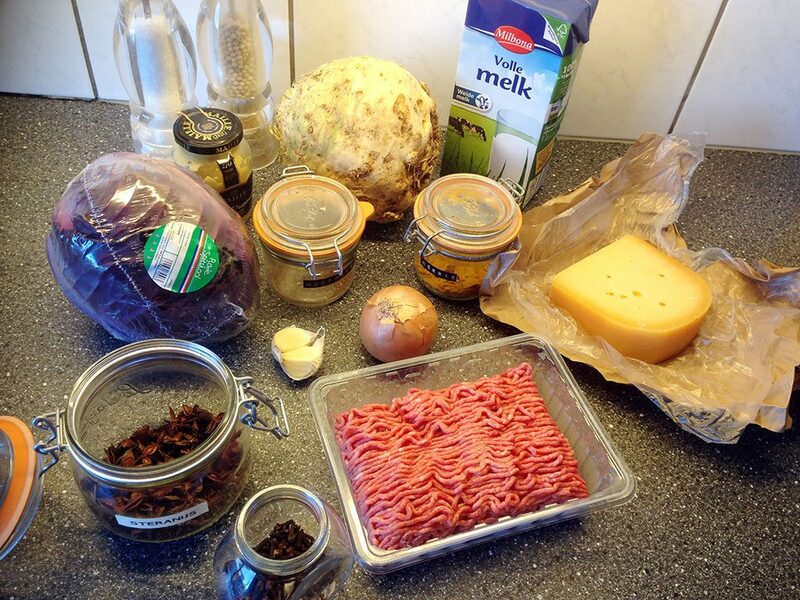 Start with a layer of ground beef on the bottom of the oven dish and then divide the oxheart cabbage. MASH the celery root and stir in a dash of milk. SEASON with pepper, salt and a pinch of nutmeg and divide over the oven dish. 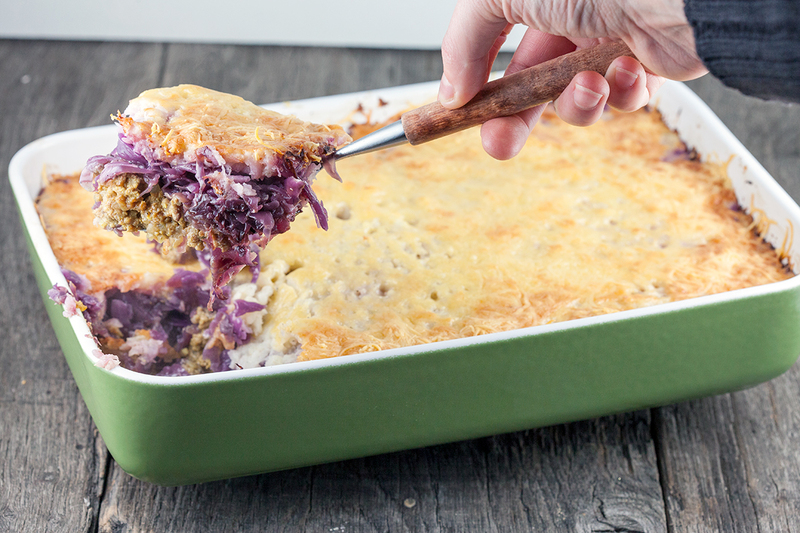 FINISH with a layer of grated cheese and BAKE in the oven for about 30 minutes, or until the cheese is beautiful golden brown. Enjoy!